Like the Abell planetary nebulae, the Palomar globular clusters were discovered in the 1950s on the survey plates of the first Palomar Observatory Sky Survey (POSS). The list of astronomers who first identified the objects as globular clusters includes some famous names, among them Edwin Hubble, Walter Baade, Fritz Zwicky, Halton Arp and George Abell himself. Several of the Palomar globulars--including Palomar 6, Palomar 7, Palomar 9, Palomar 10 and Palomar 11--are nearby clusters of average size that just happen to be heavily obscured by dust in our line of sight. Others--including Palomar 3, Palomar 4, and Palomar 14 --are giant globulars that are very far away in the extreme outer halo of the Milky Way. Although the objects vary greatly in degree of difficulty--from easy to nearly impossible--observing the whole list is a very challenging observing project for owners of big scopes. I have observed all 15 Palomar globulars with a 20" telescope. Dark skies and high power are a prerequisite for definite confirmation of most of the Palomars. In order of difficulty I would place Pal 15 as most difficult of the 15. Pal 4 is faint, about 2' in size and requires pretty darn good skies. 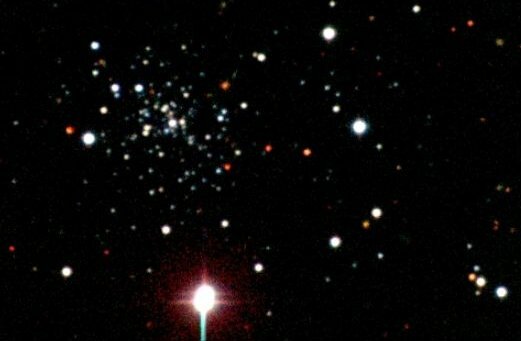 Pal 9 (NGC 6717) is the easiest. Pal 8 is a large object which is somewhat resolved in my 20". Pal 7 (IC 1276) is also a nice object. Pal 11 should also be a good one in your 17.5". Pal 12 showed several resolved stars in my 20". Pal 3 should also be within reach. I saw a faint fairly large (2.5') but distinct haze. Pal 2 is small but was seen with direct vision at 288 power. Pal 1 requires knowing exactly where to look, as it is more difficult than the published magnitude indicates. A small object visually. Use at least 200 power or more. Pal 5 is a low surface brightness object since it is large. I saw it as 5' in size. I was able to resolve one star within this cluster. Pal 13 was pretty difficult to see without using a lot of averted vision under less than perfect skies. Requires high power. A 7mm is Ok but a 4.8 showed it better. Pal 14 is not as difficult as Pal 15, its surface brightness is higher. It would be a good idea to have a printed copy of a finder chart of each field from the Digitized Sky Survey for zooming in on each cluster. Be aware that several will not be centered in the field of view in the image you download as the coordinates are not always correct in the database used for downloading by name. It is best to download using exact coordinates rather than by common name of the object. Taking advantage of a couple of exceptional star-lit nights here in southeastern Arizona, I found myself behind the eye piece from dusk to dawn. In addition to observing several planetary nebulae from the SEC database and some faint galaxies, I also embarked on a project to view as many of the 15 Palomar Globulars as possible from my backyard dark sky site here in Palominas, Arizona. Palominas is a stone's throw south of Hereford, Arizona, which itself is about 60 miles southeast of Tucson. Over the two nights, I managed to view 12 of the 15 Palomar Globular Clusters, the remaining 3 either setting before it was too dark ( Pal 1 & 2), or rising high enough after it was too light (Pal 13). I could not ask for better conditions from a backyard site than I am currently enjoying. The limiting magnitude here (for my 58 year-old eyes) is 6.3, and during the time I was living in San Jose, I was lucky to have an LM of 4.0. These estimates are for the vicinity around Polaris, so allowing for atmospheric extinction at latitude 31, but at an altitude of 4,300 ft, the LM would be approximately 6.4. I can't gripe about that! Printing out the Palomar Globular Cluster table from Jim Shields' Adventures In Deep Space site, and firing up Megastar 4 as an aid in identifying each field, I set out on Monday evening to capture the first set with the Obsession 20" f/5 that will eventually reside in the future Palominas Star Haven Observatory. On this first night of seeking them out, I caught them in this order: Pal 7, 8, 9, 5, and 14. Pal 7 (IC 1276), and Pal 9 (NGC 6717) very easy at 212X, while Pal 8 was somewhat more difficult at 212X, but showing up nicely at 423X. Pal 5 in Serpens, at mag 11.8 and at a size of 7.4' (the table on Jim's site lists its size as 3.2', and in Megastar as 7.4') is where the challenge began. The low surface brightness of Pal 5 requires transparent skies and it was better seen, with some diffficulty, at 212X than at 423X. Late into the morning, around 0300 LT, I caught up with Pal 14 in Hercules, and stayed with this one for quite some time to look around the field and ensure that I saw it several times. Requiring averted vision and high power ( since its size is only 2.1', using 423X worked nicely, giving me a field of about 11'). I also tried it at 212X, but it was extremely difficult to verify at that power. With the presence of a couple of brighter stars in or around the field, it was much easier to keep the exact locaton zeroed in. ... and it was! Instead of going after Pal 15 right off, I took on the PAL's that were in the high western skies, such as Pal 3 and Pal 4. These two globulars, among the smallest of the 15 (1.6' and 1.3') and faintest (13.9 and 14.2), were challenging to say the least! I was using 423X consistently, and without the exceptional skies that night, Pal 4 would have been impossible. It helped to have a mag 9.8 field star about 6' east of the GC to verify the exact location. Pal 3 was no cake walk either, but since the field is not terribly crowded, it was easy to pinpoint the exact spot and get the eyes working on seeing the hazy object. With Pal 4, I stayed with it for almost an hour, letting the field drift out, then relocating it again and confirming the globular's position, and slight glow. At 212X, there was nothing but the field stars visible. After these two were in the 'book', I once again chased after Pal 15 in Ophiuchus. At about 11pm local time, and using all the observing tricks, including jiggling the scope, the black shroud over the head and eyepiece, and double averted vision ( you back off from the eyepiece a little, cross your eyes and let each of your eyes view the opposite edge of the field ;>)), I managed to pull this little devil out several times during the moments that the seeing was almost as good as it was going to get. I would say I was at the eyepiece for almost an hour all told on Pal 15, but it was definitely worth it! The remaining Pal GC's that I saw this night were Pal 6, 10, 11, and 12. Pal 13's field would not be high enough to view very well before dawn, so I'll have to wait a while for that one. For these last four that I saw during the evening, several were in fields that consisted of a good number of faint stars, so it took some work in pinpointing the exact location, but the GC's were not extremely difficult (well, through a 20"!). I would say that of these last four, Pal 10 was the most difficult. Pal 6 is in a pretty populous field with stars ranging (in the immediate area) from mag 8, to mostly mag 12, and a few 13's thrown in. It was, and is, a gratifying project to view these globulars. It definitely is a worthwhile challenge, and for those with scopes in the 10" to 17.5" range that find most or all of these, man, that is better than good! But for myself, being able to see them 20 feet out from my back porch is almost the fulfillment of my amateur dreams.